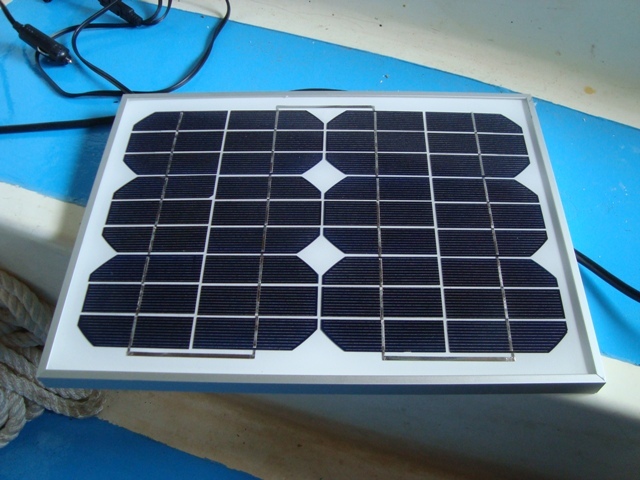 I recently came across what appeared to be an exceptional deal on Ebay for a 10 watt solar panel with a diode to prevent reverse charging. Measuring 310 millimetres by 368 millimetres the panel will fit on top of ‘Sandpiper’s’ sliding hatch. Needless to say, at only £25.95, including delivery, I thought it was a bargain. I parted with my money and the panel arrived this morning. Instead of testing the device right away, I cut the lawns while the sun shone. After lunch I unpacked the parcel, checked the contents and connected the crocodile clips to ‘Sandpiper’s’ battery. Almost immediately, I knew something was wrong, because the connector lead rapidly heated. Swiftly I disconnected the clips to prevent a serious incident happening. I had correctly attached the clips to the appropriate battery terminals – red to positive, and black to negative. What was wrong? I had my suspicion that the manufacturer incorrectly wired the junction box. I contacted the seller and asked his advice. He suggested that I should reconnect the clips, but attach the negative to the positive terminal and visa versa. On doing so I checked the connection lead; thankfully it remained cool. 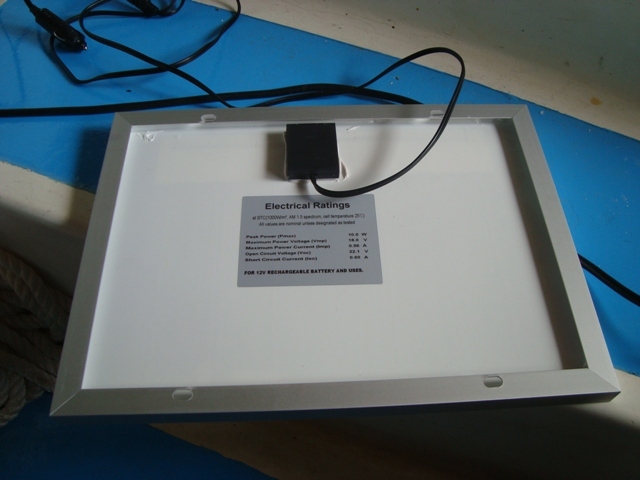 I found there was no discernable difference in the voltage of the battery when the solar panel was connected to the battery. I independently tested the output of the solar panel by using my voltmeter. I felt confident that the charger was doing its work. Over the next day or so I shall measure the battery’s voltage to ascertain if the solar panel is OK. Currently the voltmeter indicates a satisfactory 12 volts. 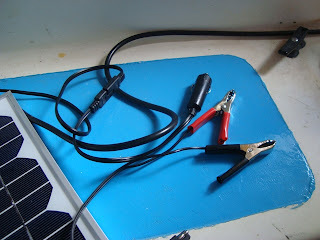 Four days ago, after I charged the battery by a mains charger, the voltmeter registered 12.5 volts. Somehow the battery has lost half a volt. The Ebay seller subsequently sent me an email to say that if things don’t work out, he will send me another solar charger.